I would like to introduce you to one very ridiculous lamp. It makes me smile, because it’s so absurd. Or, at least I thought it was absurd and ridiculous, but my confidence has been shaken a bit… more on that later. I should have included an item for scale in the picture, because this lamp is about three feet tall, in other words, it’s not a small lamp. I spotted it about a year ago at a local store that sells estate and consignment items, and it sort of struck a chord. It looked so absurd, and so sorry, with no shade and missing crystals, but it was unique (to me at least). I really haven’t seen another anything like it, anywhere in New England or anywhere in my travels. Guess I don’t travel in the right sort of ridiculous places? So, it was different, and when I see something quite old that I haven’t seen before I tend to stop and really think on it and consider whether I should grab it because I’m not likely to see it again. I think I have a ridiculous streak. Or, maybe it’s a fine appreciation for the absurd in shiny brass and crystal glittery and… wait, is that something shiny but old and extravagantly ridiculous? I had to have it. In my defense, I passed on the silver plated peacock table ornaments the next room over. I thought the price tag said $27.00. I got excited. Then I looked closer. Turns out, I completely absolutely missed an entire digit in the tag. The price tag was as ridiculous as the lamp looked, $227.00. I approached the owner and said I couldn’t afford the asking price, but I was interested. I ending up buying it for less than half of what was on the tag, but a bit more than $27.00, and I walked down the street carrying it. It was so unwieldy, I had to keep trying to dodge low-hanging branches. A friend was with me. Between the two of us and the lamp, the sidewalk was a little crowded, because as I said, this is not a small lamp. A random stranger walking down the sidewalk squeezed by, and in doing so, he leaned over, saying to me “Has anyone told you that you resemble Lady Liberty…?” Yes, this lamp, so supremely ridiculous. And to me, that makes it glorious. As I said, it makes me smile. I didn’t trust the age of the cord, so this lamp needed to be rewired, and while I can do that, I can’t when there are 10 candelabra type bulbs involved on the same lamp, so it was $40.00 to have it re-wired. I had to hunt down a shade to cover those ten bulbs, which involved a bit of wizardry and measuring, and still isn’t quite right. Fringe at the bottom perhaps? I had to track down 16 missing crystals at $2.00 each. The internet is amazing, as is your local lighting shop, where it was re-wired. The ladies at the local lighting shop called it a “formal lamp.” They didn’t laugh, but I saw a little glint in their eyes, they thought it was ridiculous. And it is, and it makes me laugh. My husband didn’t blink an eye, I introduced it as my tacky lamp, and he didn’t even get the least bit wide-eyed. All the better, I thought. Once it was all fixed up, I tried using it as a social barometer. New shade, all crystals in place, lit up in the living room for Thanksgiving family dinner with the in-laws. Surely, I thought, someone has got to make a remark about this ridiculous lamp. Everyone gathered in the living room after dinner. Some sat next to the lamp, some sat across from the lamp, but not a word about the lamp. Not a peep. The lamp was bigger than some of the guests, and definitely the most out of place item in the room ( we have a generally low-key decor sprinkled with toddler toys). I was sort of expecting a polite “where on earth…” or, “my goodness that is… amazing…(the godawful or hellishly tacky being unsaid but implied).” Not a peep. It was the three foot high absurdity that either seemed perfectly normal to them, or….? Perhaps they weren’t comfortable enough to comment on it, and I certainly wasn’t about to explain it without an inquiry. You know, except to everyone on the internet that is… But then, curiously to me, the same thing happened at a Christmas party that followed. People I have known for years, but only see once in while, and who hadn’t seen the lamp yet, said not a peep. Not one guest, not a peep. I wonder, did they not notice this three-foot ridiculous lamp, or did they not feel comfortable making a comment, even one couched in politeness? Both options make me a bit sad. So, I guess I’m trying to figure out if I need to amp up the ridiculousness of this lamp with fringe (and maybe blinking lights?) until someone comes out and says something. Somehow, I don’t think that’s the answer. Seems sort of petulant, and besides, way too much effort, too little return, and blinking lights… well that would be verging on tacky (or well over the border, depends on your definition of tacky I guess). I think I just need to accept that I haven’t found my kind of ridiculous lamp people yet. Those who can spot the glorious and the humor in the sublimely ridiculous and who can laugh at a lamp. I’m still looking. Meanwhile, this lamp is staying in the living room, totally out of place, and always eliciting my smile. Remember it like it was yesterday. She is a beauty! Yes, I think fringe, but only in the ugliest of colors!! Purple and pink leopard spotted fringe? Or a glittery gold? Daphne, this lamp has a certain charm, and with its crystals, it would fit right in with the gorgeous chandeliers in a house built in 1910, like the yellow house you lived in , in the Old West End. Now all you need are some Tiffany lamps and stained glass windows, lots of dark woodwork (painted white) , wrought iron details, and Oriental rugs, to complete the scene. Your lamp is yearning for another era! Thank you, I agree it’s charming. 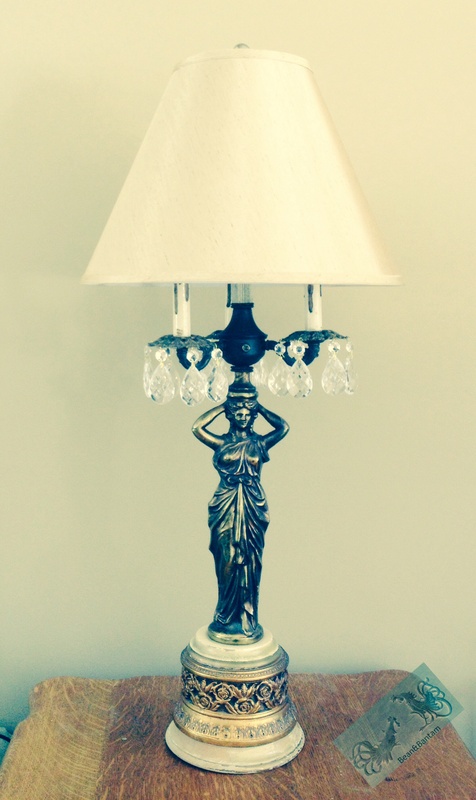 It’s fun to mix things up a bit; I’m not sure I could take an entire house in the style of this lamp! I have a super tacky brass lamp that I scored at a yard sale, that I’m just waiting to find the perfect shade for. It has no lady, but it is also huge. I think its the size that makes things tacky. I like your lamp, though! That is indeed a fabulous and ridiculous lamp! It is a fabulous and ridiculous lamp! Thank you! I think it’s great to have a few assorted ” finds” to place around the established style of our homes ( even the rustic, back woodsy kind I have here in Maine) to shake things up a bit. It makes for a great story! Then there are the families that have replicas of the “leg lamp” made famous by “The Christmas Story.” I bet no one dares comment on those, either. Your wit made me grin. I like your lamp. It makes a statement. Look at me. I deserve a little smile. Personally, I think fringe might take away from the crystals. A touch of ridiculous is fun! I have a friend that has that same affliction you have for buying that thing that might be a little ugly to someone, but it seems to be just right and has beauty in its own right. Sorry not one person in your family said a word. That’s weird. Thank you, I agree that a touch of ridiculous is fun. It’s even more fun when people understand the fun!